I look at corn with new found eyes since this summer. That's because Lil A discovered corn and I found corn chaat. In one go, it satisfied both of us. Lil A likes his with lemon juice, salt and pepper. When we don't have time to grill the corn, I simply boil it and serve it with butter and salt to Lil A and he happily munches on it. 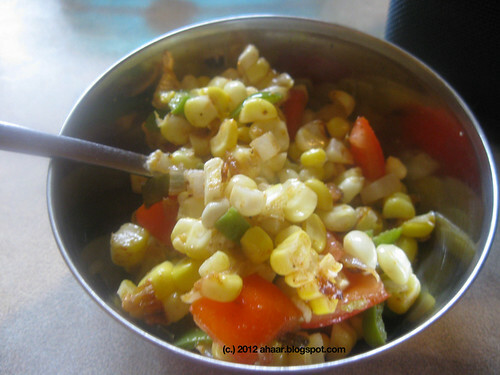 I on the other hand, douse my corn with cucumber, tomatoes, onions and pepper, liberally spice it and enjoy it in a bowl. 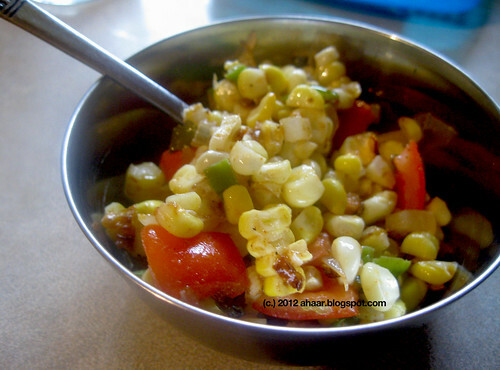 I have been tweaking this corn chaat recipe over the summer. I've made various versions of it and even made it recently for a friend's baby shower and it turned out to be a big hit. One of the things that I found in this various versions, is that I like it with sauteed onions. Yes, instead of serving it with raw onions, I saute the onion with some green peppers and it makes the chaat milder yet delicious. Heat water and boil corn till it is cooked. Or alternately grill the corn. I have tried both and it works both ways. 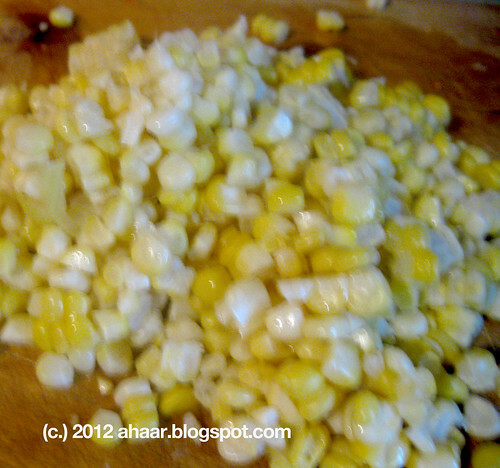 Once the corn is boiled or grilled add in the butter, salt, pepper and chilli powder. Mix it together and set it aside. In a pan, heat the oil and add in onions and pepper. Cook it on medium heat till the onions are translucent and take it off before they start turning brown. The peppers are soft yet crunchy. 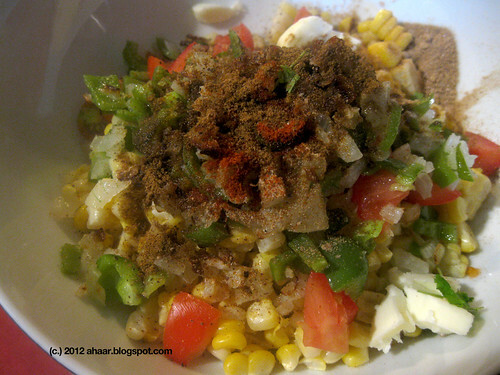 Now take a big bowl and add in the corn, onion-pepper, tomatoes, cucumber and mix it all together. 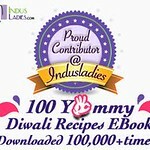 Now add in the chaat masala, aamchur powder, cumin powder, salt and lemon juice and mix it together. 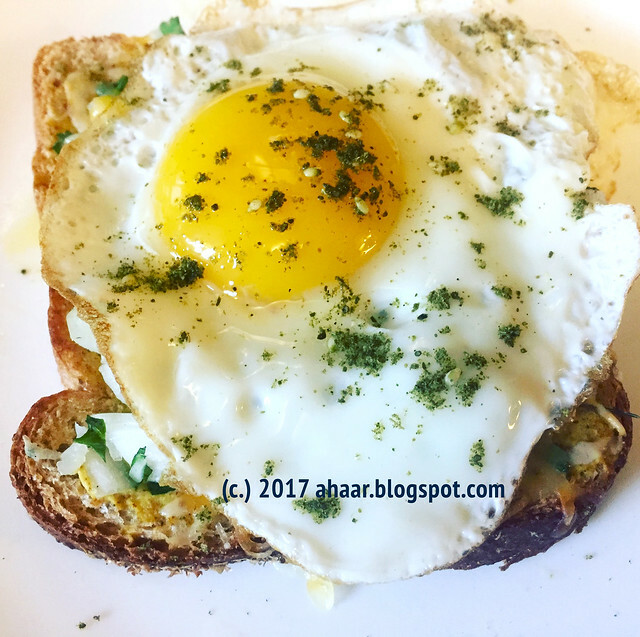 Garnish with green chillies, cilantro and serve. 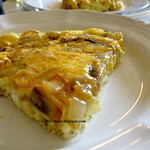 You could also add small boiled potatoes and make it into a hearty salad for a quick workday lunch. Yum! You've already heard me talk about the new grill we got over the summer. It came with a side gas burner and we decided to make inaugurate that by deep frying some Luchis or Puris. 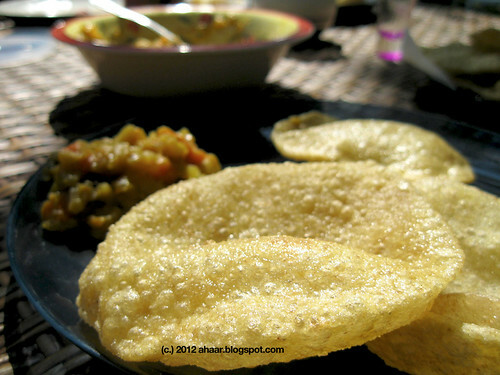 Luchis or Puris stir up strong memories of weekends at home when we would have them with kumror chakka or alur tarkari or pujo at home when maa would make these puffed beauties for narayan pujo. Cooking outside made for a perfect, relaxed morning, melding into the afternoon. We cooking outside. Lil A in the backyard with his bike, MIL making the bhaji to go with the luchis. Before I go to the recipe, here is the big news to go with some puris. Lil A is soon going to have company. We are expecting a "Tiny Lil one" soon. Lil A is excited about the news as well. In fact, he has set aside one toy for the baby claiming the rest of it as his own. But that's progress, right! Any tips on how to manage two together are welcome. 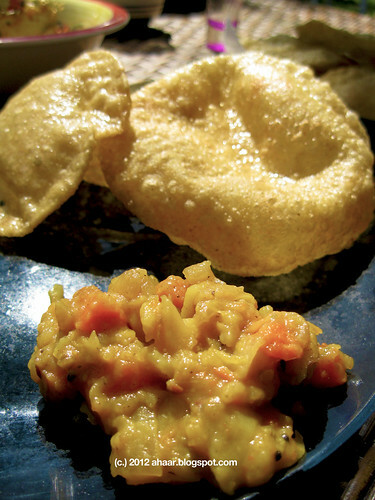 Bengali Luchis are made with All purpose flour or maida. But these are not. I made them with regular atta. Mix all the dry ingredients in a large bowl. Create a well in the middle, and add the oil and water mix it with fingertips. Then start kneading the dough. It has to be soft and that comes from kneading it nicely. Add a tspoon of oil on top and let it rest for 30-45 min. The oil prevents the drying. Heat a cup of oil in a kadai/wok. 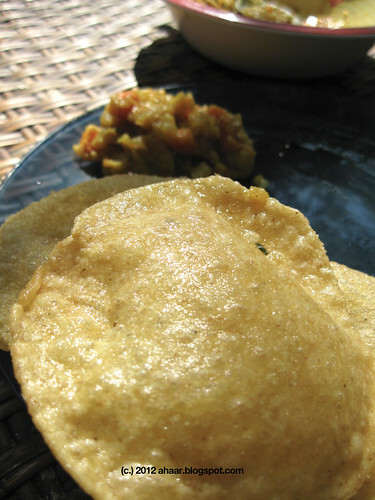 The oil has to be hot or else the puri/luchi will not rise. Once the oil is hot add a little bit dough to check the temperature. If it rises up and the oil bubbles, the temperature is right. Add the luchi/puri (and our kadai is small, so we did one at a time) and press gently with a slotted spoon. It will puff up in the middle. Let it cook for a min and then turn. It should be cooked with golden color and without too much browning. Take it out and put it on kitchen towel to soak extra oil. 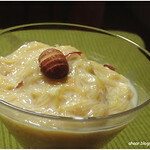 Serve hot with pickle, raita, bhaji, tarkari, payesh, or just plain sugar. 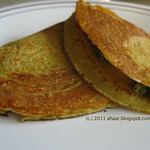 We had our puris/luchis with some simple carrot and potato bhaji. Here is the recipe. 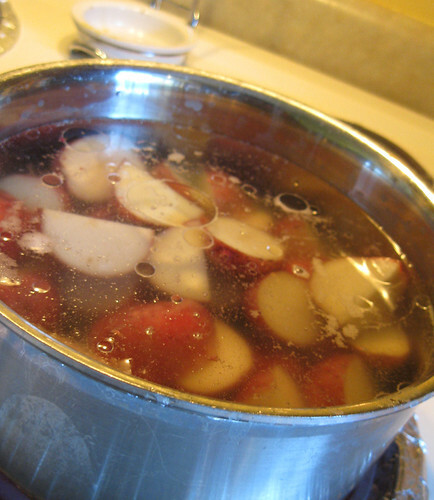 Wash, cut and boil the potatoes and carrots together. Once they are boiled mash them roughly together.Now add turmeric powder, cumin seed powder, and salt and mix it together. 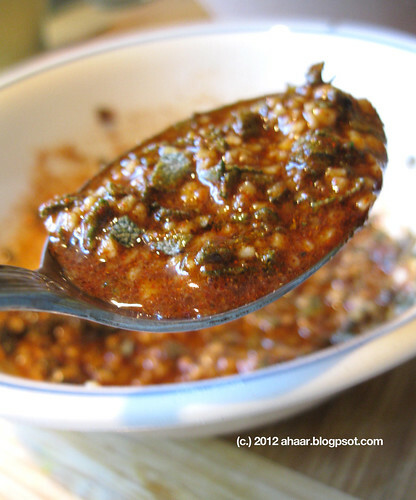 Heat oil in a pan and add mustard and cumin seeds and the red chilli. Once it sizzles, add the potato and carrot mix. Stir well to mix and then let it cook for 4-5 minutes. Adjust salt and take it off the heat. Serve warm. It even goes well together with some plain rice and dal. We finally got ourselves a grill this summer and since then have been grilling quite a bit over the last few months. But, I never get around to taking pictures of the food we have grilled so far, some delicious, juicy mushrooms, paneer, tofu, corn, and even some salmon. The salmon was a big hit with Lil A who had it right after we took it off the grill. But this time I did, and it deserves a post. 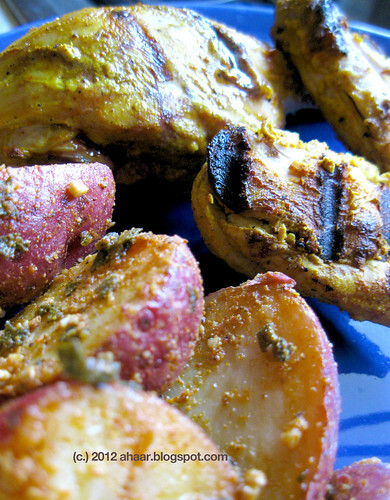 Before I write down the recipe for the tandoori grilled chicken, I want to talk about the potatoes I made to go with it which ended up becoming the star of the show, a perfect compliment to the spicy chicken. I received a bunch of fresh sage from my friend recently (Thanks Sonya!) and for the longest time I had no idea how to use it. I was using a bit here and a bit there till I concocted this recipe. All the flavors just come together and balance each other perfectly. I boiled the potatoes to save time as we were having friends over for dinner on a weekday night, but you can bake the potatoes all the way through and I am sure it will make it more crispy. Boil the potatoes with a tspoon oil and some salt. Mix all the spices together along with the remaining oil to form a uniform mixture. 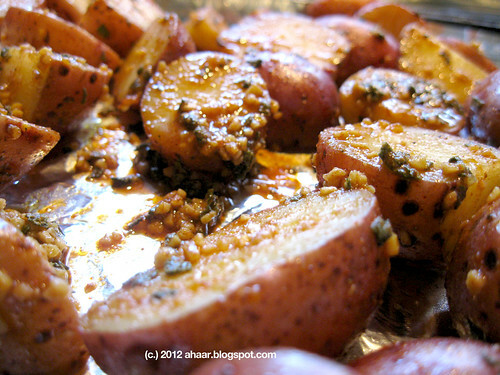 Once the potatoes are cooked, mix it nicely with the spices till the potatoes are covered nicely. Heat the oven to 250 degF. And bake the potatoes for 10-12 minutes till they start to crisp. 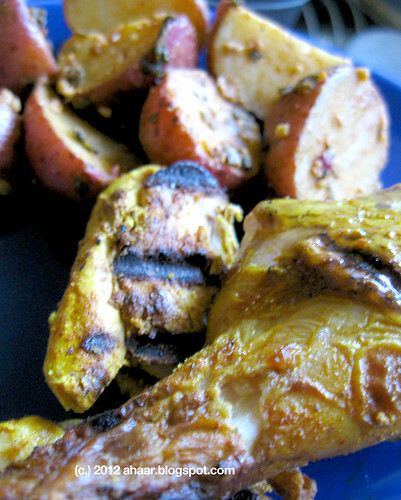 This is my easiest go to tandoori chicken recipe for weeknights when I am short on time. 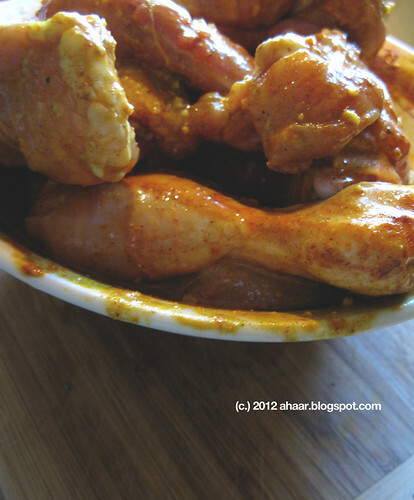 I marinate the chicken overnight and I make sure that there is some yogurt and lemon juice in the marinade. This always makes the chicken soft and tender. Paprika gives a nice color. Cooking it on the grill gives it a nice smoky taste, though nothing like cooking it in a traditional tandoor. I have been buying my chicken at the Farmer's Market and that means I have had to learn how to cut a whole chicken. Now I feel fairly confident taking one apart and serving it to guests. :) It also means that I don't have boneless chicken at home. The list of the spices is long but once you have the ingredients together then it is mixing it all together in a big bowl and then adding chicken pieces one a a time so they get soaked in the mix. I also use a fork or a knife (depending what is handy) to create small holes in the chicken to absorb the mix. Marinate for at least 6-8 hours and then cook it on the grill for 15-18 minutes turning it on sides till they are completely cooked. Serve warm. We enjoyed ours with some salad, flat bread wraps and some fresh juicy watermelons.